(CNN) -- The rollout of vaccine intended to protect against the global pandemic of H1N1 influenza is continuing on or ahead of schedule, a federal health official told reporters Thursday. 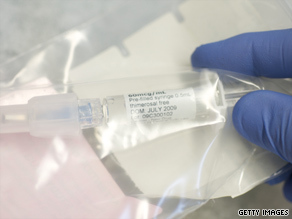 The H1N1 vaccine has begun shipping to 21 states and major cities. Vaccine makers began shipping H1N1 nasal spray this week, earlier than health officials had predicted, to 21 states and the cities of Washington; New York; Chicago, Illinois; and Los Angeles, California, said Dr. Anne Schuchat, director of the National Center for Immunization and Respiratory Diseases at the Centers for Disease Control and Prevention. Some 600,000 doses are expected to arrive at those locations by Tuesday, she said. The first round of deliveries will be the nasal spray, which contains live virus, and is recommended for people ages 2 to 49 with no existing health conditions. In many states, the initial doses of nasal spray will be directed first to health care workers. The spray is not recommended for pregnant women, children younger than age 2 or people with health problems. Some 300,000 liquid doses of the antiviral agent Tamiflu for children were ordered by Health and Human Services Secretary Kathleen Sebelius and are to be delivered over the coming week, Schuchat said. Texas and Colorado received shipments Thursday, she said. Schuchat urged the public not to be alarmed if expiration dates for some of the liquid Tamiflu have passed, because the Food and Drug Administration extended them "after careful testing" to ensure they are safe and effective. Schuchat asked for patience as the distribution process begins. "We are expecting a slow start," she said. She called the flu's impact on pregnant women "striking," and said obstetricians nationwide have told the agency they "have never seen this kind of thing before." From the time the disease was discovered in April until the end of August, the pandemic, sometimes referred to as swine flu, has killed 28 pregnant women in the United States, she said. Another 100 or so have required hospitalization in intensive-care units, she said. But Schuchat said it is not clear how the impact of H1N1 on pregnant women differs from that of seasonal flu, because the H1N1 outbreak is being more closely monitored than seasonal flu has been in the past. Still, public health officials are certain that flu activity in the United States is more prevalent now than it was at this time of year during previous flu seasons, with "substantial flu illness ... in virtually all states." CNN's Sabriya Rice contributed to this story.